In order to change your registered email address, you will need to sign in at GuideStar (www.guidestar.org) using your (old) email address and password. If you do not know the password associated with your old email address, please email us at support@candid.org and we would be happy to reset the password for you. Once you are signed in, click on the arrow next to your name in the upper right hand corner of the home page. 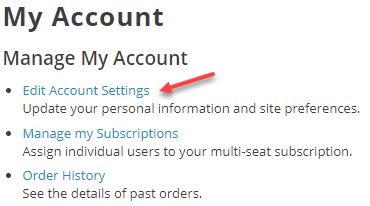 Click on "Edit Account Settings". Scroll down to the bottom of the page and click on the "Save Changes" button.